Thanks for inquiring about fishing with Capt. Jeff Rogers. Kona’s top sportfish catching captain for over two decades! 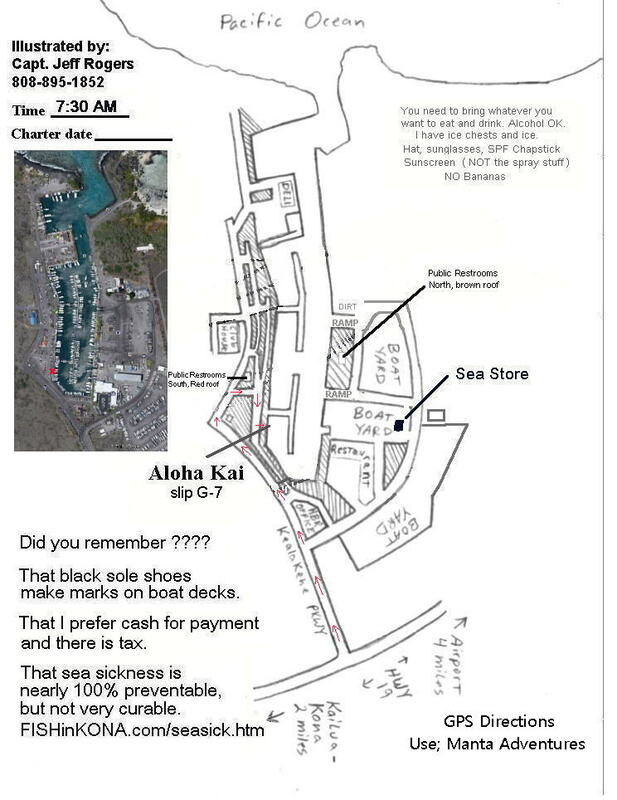 The 35 ft. “Aloha Kai” (entire boat, not per person) is $600 for a 3/4 day (6 hours) and $750 for a full day (8 hours). It has a flying bridge (upper deck with seating) and a well ventilated cabin with a dinette, couch and fully enclosed restroom facilities. Upper and lower stereo’s and 2 ice chests. This boat is for the angler(s) who want a “hands-on” experience. You are the crew! I also have a share charter option with this boat. Click here for more on that. Other costs and info: There is a 7% combined Harbor tax and Hawaii excise tax. There is no extra charge for bait, fishing license, tackle, fuel surcharge or anything else but a tip is customary. I prefer cash for payment. You are allowed to have up to 6 people in your fishing party unless you are booking a share charter. All charters start at 7:30AM. Availability is on a first-come, first-serve basis so try to reserve your fishing date(s) as soon as possible. You will only need to provide a Visa or MasterCard # to complete a reservation but remember, I prefer cash for payment on the day of the charter. This can be done either by phone (808) 895-1852 or by email. If sending credit card information by email, type your name and card number ONLY all in one continuous line with no spaces. (like this: JeffRogers5432679000568989) for security. It’s better if you give me the exp. date in a separate email or if you want to be VERY secure, text me the exp. date (never text your card number) and please include your name in the text. Please also supply me with your contact cell phone number. No charge will be put on the card until the charter date. Cancellations are accepted graciously with at least 72 hours notice otherwise a charge of 1/2 the charter rate will be charged. Your special circumstances are always considered before a charge is made. Cancellations due to weather (no charge) are rare but do happen. I will try to reschedule you or get you out on another good boat. I made a fishing season chart on my web site. There is also a very good explanation about the fishing conditions in Kona there. My unmatched fishing success comes from targeting several species of fish using a variety of fishing methods throughout the day. If you’re only interested in targeting marlin (The yearly average marlin catch rate for Kona boats is less than 25%), I’m probably not the captain you’re looking for. While I do fish for marlin (obviously) and I can dedicate most of the day to targeting marlin, I will only dedicate the whole day to marlin fishing if the marlin bite is good or we’re fishing a tournament. Otherwise, let’s just catch fish. Bring what ever you want to eat (except bananas) and drink for the day. Alcohol is permitted. There is a small store / gas station / deli in the harbor called the Sea Store that I recommend. Take the first right turn after you enter the harbor and you’ll see the signs ahead. I supply an ice chest with ice to keep stuff cold. Wear light colored, comfortable clothes. Bring a hat, sunglasses, sunscreen and chapstick. Please don’t wear black sole shoes as they will leave marks all over the non-skid decks. Bare feet are not an option but flip flops (slippers) of any color are OK. I have all the fishing tackle we need, but if you want to bring rods, reels, lures, etc… Please talk to me in advance about the type of gear. Please print out (and bring) the harbor map for reference when you come. It has my cell phone number, the time to be at the boat, what to bring and a lot more on it. Most important! Let’s have fun.